In some languages there are sayings like: the death of one is the bread of another one. A saying that suits our topic perfectly here! Since 2011 smartphone sales have outnumbered PCs and there is a clear indication that this won’t change anytime soon…so PC manufacturers better reinvent themselves as they are in extinction. An interesting thing to notice is that although the high upfront cost of laptops could easily be interpreted as the explanation for smartphone success, yet the money spent after a smartphone purchase, on an ongoing bases (usage, apps,…), make a smartphone much more expensive than an average laptop. People do not seem to mind spending a fortune on their best companion, over and over again. But behind this finding seems to hide a well-planned strategy cooked up amongst key industry players…similar to what printer manufacturers do with their inks. Almost a new conspiracy that aims at your money, without you feeling it that much, and with the PC manufacturer as the other loser. Besides smartphones, tablets (and mini-tablets) also count for the death of the laptop. You can see a tablet as an extension of a smartphone…similar technology, bigger screen. The day that keyboards were a must have gone too…even the oldfashioned Blackberry now has a glass screen keyboard added to what they hope to be the rescue for their company. Then there is the portability of a smartphone…opening up to all sorts of usage and applications, for example for sports. Their connectivity “always connected” using WIFI and 3G (4G) is another step ahead of its laptop counterpart that usually only has a WIFI connection possibility, making it the portable choice for most people. Although smartphones/tablets do not have the cheap and large storage capacities as do laptops, cloud storage has already solved that issue. 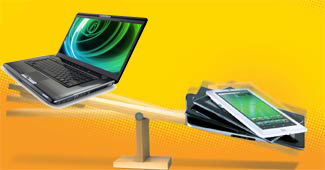 And finally, laptops won’t ever win on price as cheaper models usually are seen as bad PCs… RIP laptops! Don’t wait to join the downfall of the laptop, make sure YOUR business adapts to the new reality and make all your online communication fit for mobiles as well. Online marketing begins now mobile…Web Apps are simply a must. Contact OptimaSit now at solutions@optimasit.com and join the mobile revolution!